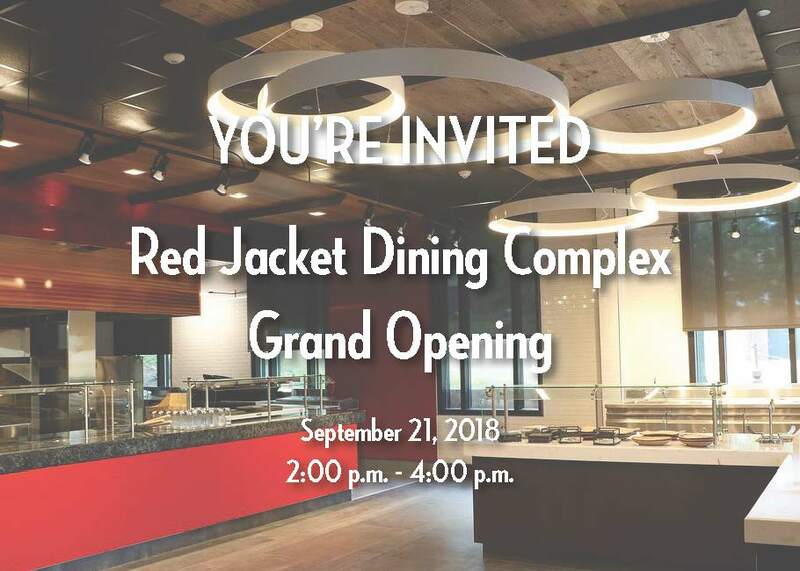 GENESEO, NEW YORK, July 29, 2018 – Campus Auxiliary Services (CAS) is proud to announce the grand opening and ribbon cutting ceremony of Red Jacket Dining Complex. Campus Auxiliary Services (CAS), a not-for-profit company dedicated to serving the SUNY Geneseo campus, invites community members to the grand opening event taking place Friday, September 21 from 2:00 – 4:00 p.m. The ribbon cutting ceremony will be followed with a brief reception at the Twisted Fork station. SUNY Geneseo President Denise Battles welcomes project partners, as well as both the college and local communities to the ribbon-cutting ceremony. “We are happy to introduce the SUNY Geneseo and the local community to this beautiful space we’ve worked so hard on”, says CAS Executive Director Mark Scott. The 5,000 sq. ft. space highlights nourishing food but also a sense of community, a place that customers feel is their own and where they can connect and communicate. The restaurant provides a place to relax, discuss, debate and laugh together. The two-year renovation was lead by a local architectural group, Edge, who worked with 3 additional local companies to facilitate the renovation project. The newly renovated Red Jacket building features Red Jacket, the pay-one-price dining hall located on the lower level, as well as Jack’s, a retail style restaurant located on the upper level. Red Jacket is dedicated to our newest pay-one-price restaurant, with stations including Twisted Fork (chef-driven creative cuisine), American Grill (traditional favorites), Roots (plant-based offerings that accommodate vegan and vegetarian driven diets, Clean Eats (dedicated to serving food free of the top 8 food allergens), soup, salad, dessert stations and more. The building features an upgraded elevator and bathrooms, which are now ADA compliant, as well as a new walk-in entrance on the lower level. The renovation encompassed many sustainable features, including eco-efficient ovens, dishwashers, combi-ovens, as well as the LEED-certified modern building. CAS partnered with over 40 local partners to complete this project. Over 55 percent of food served is locally sourced, with a large portion coming from local food partner, US Foods. The American Grill and dessert station features repurposed bard wood, which was sourced locally. Seating and dining areas feature furniture creations from the local companies Staach, Urban Lumberjax, and Gunlock.